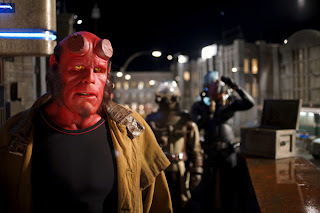 “Hellboy II” had much of its thunder stolen this summer, having been released a week before “The Dark Knight”. It’s a shame because after making what possibly would be director Guillermo del Toro’s best film he’ll ever make, “Pan’s Labyrinth”, his follow-up film should have been a bigger deal than it was. This has to do, in part, with the humility of the talented filmmaker. After the great success and numerous awards heaped upon his previous indie-art house hit, he did a 180 and went back into the comic book genre for another round of “Hellboy”. Of course, Del Toro’s no director for hire in this case, “Hellboy” is one of his passion projects and the evidence is all over the screen. This second entry in the series begins with a flashback to Hellboy’s youth. His mentor Professor Bloom (John Hurt) tells the red boy a nightmarish bedtime story about an evil king and a golden army of mechanical warriors which lays dormant beneath the earth ready to be awakened. In the present the son of the King, Nuada, returns from exile along with his evil troll sidekick to reclaim his army and takeover the world. The Bureau of Paranormal Research and Defense put their number one demon fighter, Hellboy, on the case (but really, is there anyone else for the job?). Returning to help him out are his girlfriend Liz (Selma Blair) who can turn herself into a fireball at will and Abe Sapien (Doug Jones) a fishlike aquatic man who can breathe underwater. Del Toro takes his time entertaining us with absurd comic interactions with the heroes before sending them off into the action scenes. Abe Sabian gets a significant romantic subplot with Nuada’s twin sister, and Liz and Hellboy continue their tempestuous relationship. The plotting is minimal at best, but “Hellboy II” serves to let Del Toro run wild with his imagination and put to screen an astonishing array of fantastical creatures, underground worlds and gothic atmosphere dripping with life. The attention to detail with his rendering of the Troll Market as well as the giant tree monster which grows from underneath Manhattan to battle Hellboy has as much grandiose mythological wonder as anything in “Lord of the Rings”. Of course, that’s exactly what Del Toro is tackling next, “The Hobbit”. And it’s a natural fit for him. While it’s exciting to see two great artists (Peter Jackson and Del Toro) collaborate on such a high level, part of me will miss the personal, idiosyncratic qualities of Del Toro’s choices of films. According to the IMDB Del Toro was twice offered a chance to make a Harry Potter film but in both cases turned it down to do his two “Hellboy” movies. Since the Hobbit will take up many years of his working life, will we miss out on other personal films in the order of “Hellboy” or “Pan’s Labyrinth”? I did not like this film (and I liked the first one). Both romantic subplots were really uninteresting. The end "twist" was pretty predictable. To me, the film was just boring and a chore to sit through. I also had high expectations though because I thought Pan's Labyrinth was wonderful film. Johan Kraus wasn't the prince, he was the agent made of gas. The prince was Nuada. HB2 was one of my favorite films of the year. With all the cynical cinema this year, this was breath of fresh air. I'm saddened by the fact he won't be revisiting Hellboy for a long, long time. Thanks for the note about Nuada - I've made the correction.